A DROGHEDA man is about to embark on a little piece of history as he prepares to travel to England to take part in a very unique international tournament. Andy Matthews from Five Oaks is a member of the Irish Amputee Football Association, and the team, made up of players from all over the country, are one of four countries taking part in the Four Nations Championship. Andy lost his foot when he was just four years of age, but it hasn't stopped him from excelling in many sports including football, wheelchair basketball and table tennis. 'We are all so looking forward to heading over for the first time, as this is a very new sport to Ireland, and even relatively new for the UK,' says Andy, who is originally from Balbriggan. The squad will depart from Dublin on March 30th and over the following two days will play against Poland, Germany and Great Britain in a four nations championship. 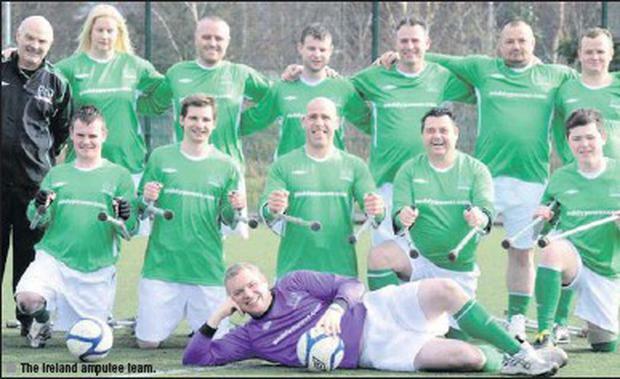 They have recently received another big boost in that Paddy Powers Bookmakers has agreed to sponsor the team.
' This is an amazing milestone for the club, and the lads and one lassie have put a huge amount of work and training into getting this far,' says Simon Baker, Development Officer with the Irish Amputee Football Association. Andy says that because he has been an amputee for so long he is used to playing sports, but those who have lost a limb more recently may not even know the sport exists. 'We are always seeking new players and also need arm amputees for goalkeeper,' he says. The team train in various locations twice a month, and the matches are very strenuous so are slightly shorter than other matches.
' The sides are 20 minutes each, and I play mid-field or centre back, and we all remove any prosthesis to make it fair for everyone,' adds Andy. Anyone interested in joining the team can get more information on the FAI website or Irish Amputee Football facebook page.